For many years, preventative maintenance has been part of routine work processes at most bio/pharmaceutical companies. The challenge in most cases is striking the right balance between enough preventative maintenance and not too much corrective maintenance, all at a reasonable cost. Best-in-class corporations have a high ratio of preventative to corrective — 5:1 or better — and use mean time to repair (MTTR) and mean time between repairs (MBTR) to improve technical uptime and reduce planned maintenance time. Centerlining is an element of continuous improvement for manufacturing and by far not as widely used as preventative maintenance. In the design for centerlining, manufacturing/operations, engineering, and maintenance work together to set up the system. It is known to drive the preventative/corrective ratio in favor of preventative maintenance. Centerlining is the method for reducing product and process variability and increasing equipment efficiency in industrial processes and manufacturing environments. Beginning with the engineering design criteria for the machine or equipment, the objective is to ensure optimal settings are always used during production. Centerlining also aims to give early warnings of system trouble. For decades, centerlining was considered a laborious process with much manual work. But with today’s electronic equipment control systems, we can collect, analyze, visualize, and share time-series data from multiple sources with people and systems easily. During the design and setup, collaboration is key, and deep understanding of the equipment, technology, and processes is required. In centerlining, the critical few process parameters are identified and linked to the plan of control, thus reducing the introduction of variation in a process and its products through “input variables” (the settings that are under operator control). Centerlining is part of the continuous evolution of manufacturing excellence. Building on setup reduction (also known as single-minute exchange of dies) and 5S (workplace organization and housekeeping using the “Sort, Set to order, Shine, Sustain, and Standardize” methodology), it guides consistent production. A plan of control structure helps identify the critical few process parameters. There are four main categories: raw material requirements, process control details and their set points or ranges, targets for product and process characteristics, and test methods and requirements. The critical few parameters simplify the process operation, reduce process variation, and provide consistent focus on the important process parameters to best meet the product’s output requirements. The output requirements close the loop with the plan of control, SOPs, process engineering sheets, and product output characteristics. The plan of control for manufacturing contains the actual manufacturing process and clear identification of the points of measure and properties to control. Different production line setting sheets may exist for different products, each so specific that the production line can be set up to run the product with only minor fine-tuning required. For the different jobs that need to be performed in the manufacturing area there will be instructions, enabling consistent performance, but also job descriptions; RACI (responsible, accountable, consulted, and informed)-matrices; and operator manuals. For the site as a whole or this part of the manufacturing organization, the plan of control should contain a meeting structure and interconnection diagram, with documents clarifying meeting purpose, frequency, attendees, timing, common agenda, and action list. For the products, the plan of control contains product specification sheets, making it possible to verify whether products comply with specifications. Product limits may be staged to match different internal (operating window) and external (sales window) specifications. A nonconformity manual should have product characteristics that are hard to quantify clearly identified by means of samples that do and do not fit the specifications. For maintenance, the plan of control contains the maintenance process or flow with its specific points of control and associated measures. A recurring or annual plan of scheduled maintenance should be included. Details on internally and externally sourced activities should also be provided. Log sheets for recurring activities build a history file, manually or automated. Work instructions make it possible to standardize the work packages and improve consistency and compliance, improving the planning and scheduling function. Recurring or weekly control route sheets should be part of the plan of control for monitoring performance of equipment, but also for condition monitoring (vibration, thermographic, balancing, etc. ), and supported by inspection instructions. At the receiving end, for logistics the plan of control should contain relevant bills of materials for the products produced by manufacturing, allowing perfect staging of raw materials and production supplies. Also, for the storage of the materials and supplies, proper specifications should be available, using material safety data sheets, suppliers’ product specification sheets, and other supporting documents. At the other end supplying the finished goods, for logistics the plan of control contains a warehouse flow and layout to clearly identify appropriate and agreed-upon storage areas. The logistics function should include service agreements. This is done in collaboration with sales and needs to contain the approved and agreed-upon service levels in terms of safety, quality, quantity, and timeliness. Metrics, reporting structure, and meeting frequency complete the plan of control. Raw material characteristics need to be explicitly set, agreed upon with the supplier, and checked on receipt. Raw materials are input variables not under operator control and, as such, easily blamed for process variations — a topic outside the scope of this article. First, these adjustments usually adversely affect the product. Since the wear and tear are covered up, the maintenance necessary to keep the process reliable and predictable is put off until a major (and typically more costly) failure occurs. That cost is the second problem. A corrective maintenance activity to resolve a failure is easily 10 times more costly (maintenance technician time, equipment downtime, lost output, and consequential downstream effects) than a well-planned preventative maintenance activity of the very same part of equipment. Process input variable changes in response to wear of equipment are in fact an early warning of process problems: Adjustments are a part of manufacturing, but when used to compensate for equipment wear they can result in costly failure modes, poor quality, and/or poor production rates. Adjustments outside the normal set point ranges indicate a need for root cause identification and should be recorded as an early warning for maintenance. The motor current relates directly to the torque of a motor for the stirrer in a vessel and is a good indicator of the viscosity of the liquid inside, but also an early warning indicator of wear on the shaft bearing. Early indication allows for timely replacement and salvage of the batch. Pressure drop over spray nozzles with tablet coaters can be an early indicator of a clogged nozzle. A clogged nozzle results in uneven tablet coating, quality issues, and discarding of the batch. Vibrational analysis of bearings indicates possible wear due to misalignment. Such early indication allows for timely replacement and limits downtime for replacement and alignment, retaining as much uptime as possible. Very low tolerance alignment of joints between the motor and gearbox or the gearbox and equipment can lead to a significant extension of the life span of the motor, gearbox, and shaft in the equipment. The hardness of silicon rollers for foil feeding in a packaging line can indicate wear, as the silicon hardens over time under the influence of heat. Consequently, the slippage of that roller increases, leading the operator to tighten the gap of the roller to continue to foil feeding. This squeezes the foil and adversely influences its quality, but also increases the torque on the motor, increasing its electrical consumption and thus creating wear on both the rollers and motor. Time lost for adjustment or accurate positioning of machine components can represent as much as 25 percent of a changeover time duration. Centerlining of production lines provides the operator with an obvious, at-a-glance point of reference to assure proper setup of production equipment. Unquestionable connections reduce the likelihood for mistakes and the time required for setup. Additionally, centerlining allows equipment operators to complete a setup without calling maintenance and provides a simpler process for training inexperienced employees. There are many benefits from a centerlined process. As previously stated, the critical few process input variables are defined and controlled to set points or pre-defined ranges. Out-of-range adjustments are logged, and corrective action is taken to restore centerline conditions. Centerline parameters are linked with the plan of control, SOPs, process engineering sheets, and raw material and product specifications. higher throughput of the equipment, improving on-time delivery and customer satisfaction. Waste is reduced, improving raw material conversion and reducing the cost of goods. 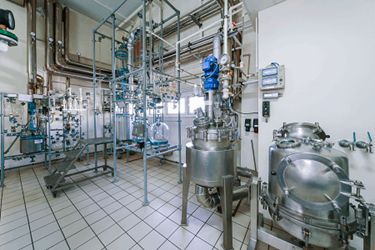 reduced process variability leading to a more predictable and reliable operation with improved raw material usage. product characteristics that are more stable and yield improved quality, making processing on downstream equipment more consistent and improving customer satisfaction. Further benefits exceed location: general reduction of process variability is shared between locations, as is a standardized method for determining critical process set points. The best settings for each product/process are documented and standardized. Being unable to run at the best settings provides a signal that something needs to be corrected. The benefits of centerlining come from documenting the best settings for a given combination of process and product. One also needs to forbid operation off centerline values or outside centerline ranges and provide signals of process trouble (deviations) when operation is not possible at the centerline settings.